Our Tube Inspection personnel are some of the best in the industry. They provide many years of nothing but tube inspection services and are in high demand throughout the country. 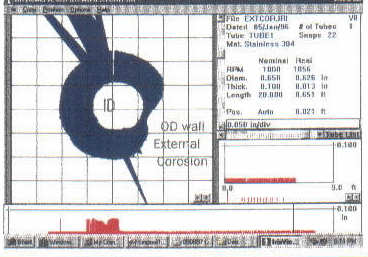 Most NDE companies are limited to the number of and type of tube inspection services they provide. At Engineering & Inspections International we offer the most advanced types of tube inspection services available on the market. We give our clients the option of selecting the best method and system based upon their individual needs such as type of damage mechanism, type of corrosion and/or erosion, ID or OD related, the product system, the amount of cleaning that can be obtained, or even the most economical method based on a particular budget. Heater Tubes, Fin Fan Tubes, Exchangers, Condensers, Feedwater Heaters, Boiler Tubes, Air Ejectors, Hydrogen Coolers, and Air Conditioning Tubes. We utilize equipment such as the Corestar and Zetec Systems capable of Eddy Current Testing and Remote Field Eddy Current Testing for both Ferrous and Non-Ferrous Applications. Furthermore, we also provide tube pullers to achieve 1000 tubes per day in the right application.